Illinois has a diverse number of trees that grow within its borders. The state has large forested areas in its southern region, with more annual rainfall and warmer temperatures creating favorable conditions for a number of species that do not occur in northern Illinois. The process of identifying Illinois leaves entails looking for specific aspects of the leaves that help you classify the species and then narrowing down your identification to the exact type tree. The leaves of the hickory trees in Illinois are compound leaves. This makes their identification somewhat more complicated, since each leaf has many parts. A central axis and individual leaflets make up a compound leaf. By studying such features as the length of the axis, leaflets and other facets of the leaf you can distinguish the hickories. The bitternut hickory leaf, for instance, has a hairy central axis from 6 to 9 inches in length, with the attached leaflets from 2 to 6 inches long and shaped like lances. Their colors are yellowish-green on the upper surface but lighter shades below. The leaves of the eastern white pine, one of the few conifers native to Illinois, take the form of needles. 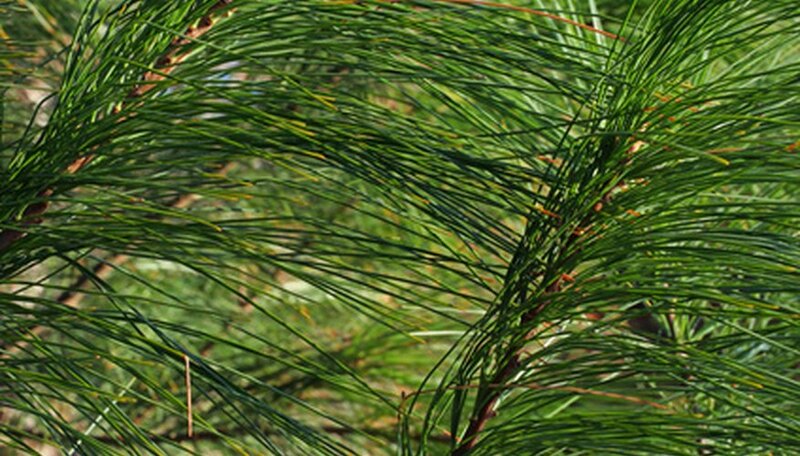 Eastern white pine needles are easily recognizable for two reasons. One is that they will grow in bundles of fives from the branches, while the other is that the bluish-green needles are in the 3- to 5-inch long range. Eastern white pine only grows in some of the northern counties of the state. Illinois maple trees have leaves possessing lobes — extended areas separated by indentations along the leaf’s edges. Maple leaf identification in the state depends upon the number of lobes, how deeply these indentations reach into the middle of the leaf and the shape of the edges of the lobes. The sugar maple, for example, a tree growing throughout the state, will have five deeply indented lobes that each taper to a distinct point, notes the Illinois State Museum website. The white oak is the state tree of Illinois. It has 4- to 7-inch long leaves that grow alternately on the twigs, as do all oak species, with the leaf owning an oblong shape. The white oak leaf will have from seven to nine lobes, each of them rounded, with the longest of these finger-like projections existing near the middle of the leaf. You will notice that white oak leaves are a shiny green color on their top surface but a bit whitish on the undersides.